So after last week’s misfire of an episode its great to see this episode getting things back on track if perhaps at the same time serving as something of an info dump as we get several big moments through the episode including the introduction of the series big bad “Glory”, Giles reopens the Magic Box, Joyce gets more sick and most key here we find out the truth about Dawn. it’s really a jam packed episode. If you were keeping track of the Buffy big bad’s “Glory” would really be the high water mark for the show as really its all downhill from here and while we might only get a small sample of her in this episode its enough to make her an intergrating opponent for Buffy. For one Glory looks like she just came out of the valley with her red dress and heels get up and despite her appearance she also has superhuman strength and toughness that not only see’s her battering Buffy with ease during the first confrontation at the episode climax which in a rarity for Buffy actually sees her running away knowing that she is outmatched by Glory. If that wasn’t enough it become clear here that she is also responsible for the sudden increase in crazies around Sunnydale, which are a by product of having their lifeforce sucked from their bodies by Glory. The fun aspect to her character though is how childlike she is with her emotions as seen at the end of the episode where her tantrum collapses the warehouse on herself. 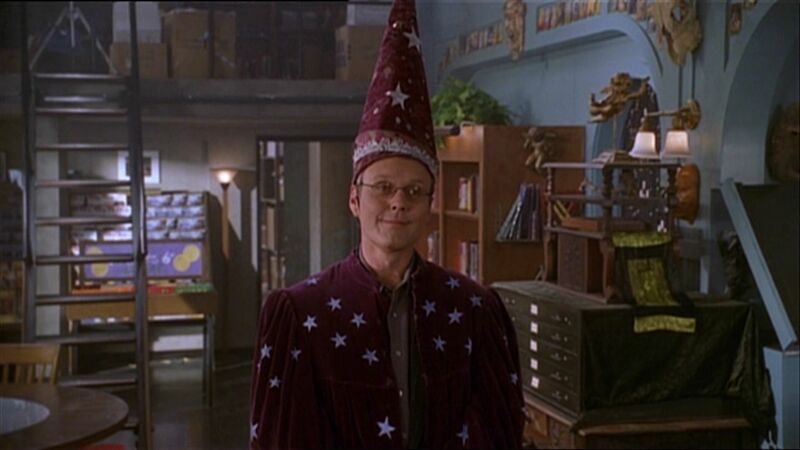 The Magic Box has since the start of the season made for a surprisingly good base for Buffy and Scoobies, especially after being so displaced during the forth season which lacked a location for the group to gather and as such saw them spending a lot of time hanging out at Giles’ apartment. The Magic Box not only has the Slayer training area in the back, but as we see here also gives Anya something to do, after Giles initial excitement at customers coming in soon fades when the store becomes overun with customers making it possibly the busiest magic shop in the world, especially for such niche items. Here we also get to see the Capitalist side of Anya with her love of money as she tells customers to leave the store once they’ve paid not seeing a reason to be nice once she has their money while all done in her wonderfully deadpan style reminding us why she is such a highlight of this show. Joyce’s illness continues to be a worrying reminder of what lies ahead for those of us re watching the series as Buffy believing her mother is being cursed and that her illness is possibly supernatural uses a trance spell to reveal all magic which of course reveals that her mother’s illness is not supernatural but her sister is. While I would have expected the show runners to have teased out the truth about Dawn but here we are a mere five episodes in and already getting some huge revelations. While perhaps the reveal that Dawn is actually “The Key” an entity given human form and implanted as Buffy’s sister the monks knowing that the Slayer would protect her I felt was a great explanation while her actual purpose and why Glory wants her is thankfully still kept as a mystery. The only really down point to the episode is Spike’s growing obsession with Buffy which means we get a brief appearance from him where its hinted at that he’s been hanging outside her house, though all we get from the pair this episode is a brief exchange of insults which ultimately feels like unneeded filler even though its part of a long game being played here. Ultimately though its a minor issue in an otherwise fantastic episode.